Fred Wilson wrote a blog post a few hours ago about the “all or nothing” vs “keep what you raise” crowdfunding models in which he describes the latter as lame and convincingly explains why. I urge you to read the post in the unlikely event you haven’t already. I thought about it for a few minutes and agreed on all counts with Fred’s wisdom in the context in which he’s discussing the issue, namely for a venture raising money and essentially being subject to the same market dynamics that apply to all traditional fundraising channels. But my mind immediately started to race in other directions, considering alternate views, and I can envision a use case in which crowdfunding could become a community-building tool in our society. Currently, crowdfunding is largely popular for bringing hardware products to market. But there are other motivations that can come — and are already coming — into play as well. We can use crowdfunding, not only for charity, as for example Razoo and Causes are doing, but also as a platform to give the underdog, among others, a sense of belonging to the community. 1. Someone who is undergoing rehabilitation of some kind, either from a medical condition, from an accident, a life of crime or drugs, to raise money for building something of worth. 2. The elderly who could be given a sense of purpose as well as a stream of revenue from also building something of worth. 3. Children with an entrepreneurial streak could be given an avenue by which to get started. 4. Even the homeless can be helped through crowdfunding. Each scenario would need to be evaluated separately and safeguards put in place as required, it goes without saying, but the social impact could be enormous. I pointed out to Fred, in the comment section of his blog, that in the event where the motivations of the backers are something other than helping getting a business off the ground in the purely transactional sense, it matters less which of the two above-mentioned crowdfunding model is used. 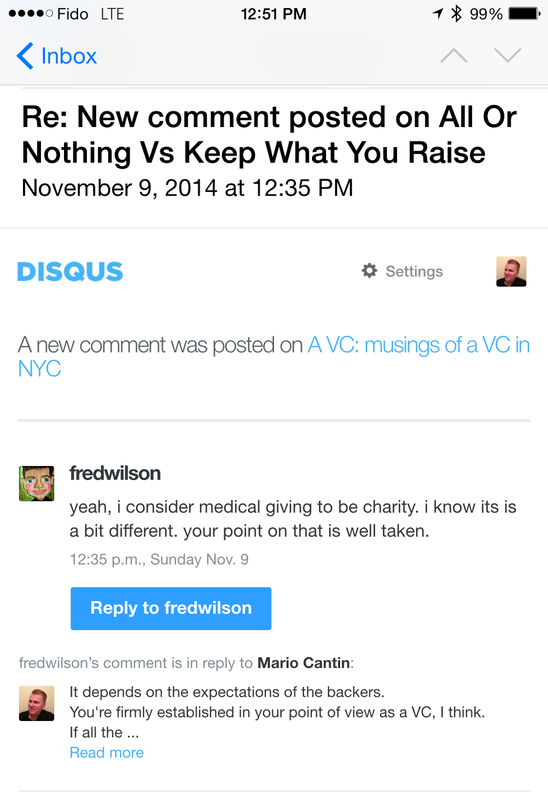 He concurred and modified his post to include an exclusion for charity use cases.